Godly preaching and seminars will help encourage you using God’s Word to listen and tweak or overhaul those weak spots in your parenting. They also help you see those areas you should continue in doing right. When we were new parents a free parenting seminar offered in our church by a local pastor over a weekend sparked our hearts for knowing we needed to have a godly aim in training our children. We enjoyed it so much we bought the CDs from our church bookstore and we still listen to them. (White CDs on book). The Child Training Bible helps us use God’s Word in preventing and dealing with problems. You can see one of the cards from the set sitting on the Bible. A friend sent this to us and we love it! It can be used as a more organized system of tabbing your Bible with color-coded tabs that match the colors on the card, but we prefer to keep the cards in the front of a Bible that stays on our bookshelf. The usefulness of this tool is easy access to Bible verses when you need them in a teaching moment. The card pictured covers the topics of: anger, complaining, defiance, discouraged, disobedience, fear, and fighting. It can easily be used as “preventative” devotional type teaching as much as it helps when you need to address a heart issue in parenting counseling. The cost is $9 (plus shipping) is a great deal for the time it saves you from individually looking up verses from a concordance. Bible-based Parenting Books by Christian people can be as good as direct one-on-one parental counseling because you can refer to them again and again. You have to be wise concerning advice often evaluating the spiritual background of the author, it is best to find authors who share the same Biblical beliefs as you do. The book God has directed me to pick up again, Raising Real Men by Hal and Melanie Young (book on the far bottom left of the photo). Their conservative viewpoint of helping parents build up boys to be masculine defenders who protect women and become godly leaders is helping me focus on our 11 year old and 10 year old sons’ needs. You can find their book at their website. *Note: Most of their Biblical references do not come from the KJV Bible and I use my Bible to read the verses. Reading the book of Proverbs is a regular way of helping children see and understand God’s view of the wise, simple, and scorners. Some people suggest reading a proverb a day to help gain wisdom. For our children we may only read 1-6 verses at a time and describe them in depth. S.M. Davis former pastor and creator of Solving Family Problems preached regular family revivals at our former church and we picked up a copy of the Picture Proverbs Deluxe DVD set he produces (DVD set seen on left middle of photo). On the DVD you view narrated slides of each Proverb complete with sound effects and many Biblical story pictures that can help the children learn a real application of the proverb being taught. He suggests watching one proverb a day with your family and looking up the Bible stories together as a family. There are some other free resources on his website that can be a blessing to you. Doorposts Resources are excellent for training children. In the photo you can view the Go to the Ant Chart and their book called “Plants Grown Up” which is a project book for helping sons grow into men. We also use their If-Then Chart in our home for rules and direct consequences. Go to the Ant Chart quickly refers you to common character problems that come up when children are supposed to be working and decide to come up with excuses or laziness. Just bring your child to the chart and point to the character issue and ask them to answer the question and then see a section of scripture that instructs them to do right. Plants Grown Up and its’ companion book for girls, Polished Cornerstones, contain projects on specific types of character to build on including memorizing scripture and community and home service. The topics include: virtue, knowledge, temperance, patience, godliness, brotherly kindness, and charity each with sub-topics to practically apply them. *Note: Not all of her resources are from the KJV Bible you have to do the job of checking the references. We have adjusted our charts to have a piece of paper cover the verses and have them written in KJV. Institute in Basic Life Principles Character Booklets are resources to use for family Bible time, individual study, or referencing when you see your child needs growth in an area. We currently have the first 6 booklets which cover: attentiveness, obedience, gratefulness, truthfulness, orderliness, and diligence. Each book highlights a specific animal God created and how its personal characteristics display the character trait being taught. My favorite part of each book is how it highlights how Jesus displayed the character trait when He lived on the earth. Then, each book teaches “how” you are truthful to different authorities in your life, your parents, your boss, civil authorities, etc. If you really want to go all out and make the character teaching really fun they have calendars, collector cards, coloring books, posters and hardback copies of the book sets. 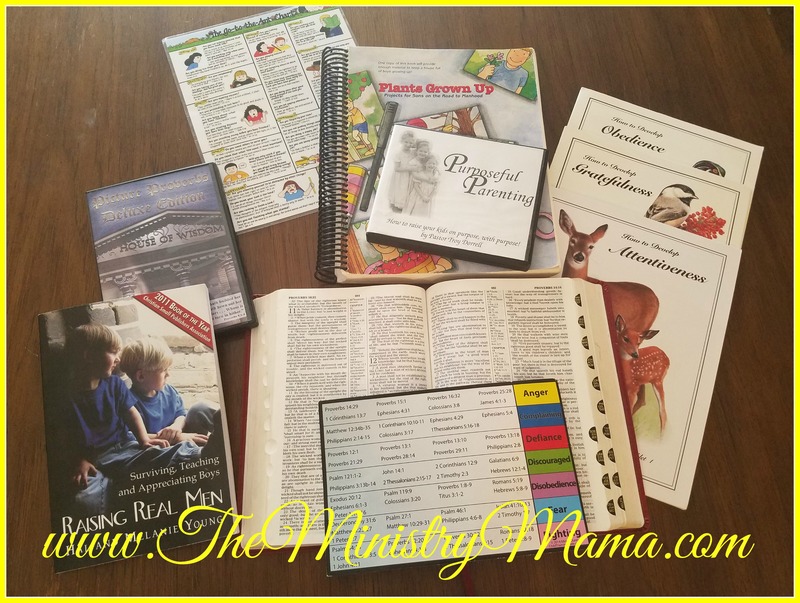 What we have found is these character building resources really help us counsel our children in Biblical answers for character and sin problems. Many times our use of these resources is preventative, we believe in teaching before expecting specific behaviors. They are also corrective helping guides as we show the children when they have done wrong and help them see the problem from God’s perspective. We also firmly believe the aim is to help our children train the heart to love God and understand His Word, have a good relationship with Him, and learn to reconcile with others they have sinned against. We spend a hefty amount of time counseling, more than I ever expected, coming back to the Word over and over again (betimes) to reinforce our expectations have a root in God’s truths. The biggest and best part of character training and having good resources is seeing the investment come out of our children into their every day living. When they respond or do right in a temptation circumstance it is a blessing. Honestly it has also helped us be more consistent as parents and grow in our faith, helping us to be faithful and try to avoid hypocrisy as our parenting is open before all their eyes. I pray and hope if you are focusing on building the inward person of your child you will remember to encourage them and instruct them to salvation in Christ. Unsaved children will struggle in character issues because the Holy Spirit is not naturally guiding them. Keep encouraging them to see their heart problems are sin related and they need the help of the Saviour. When and if they are saved remember the Christian life is a step-by-step process. Children will excel in many areas and fall back, they will react to life each differently and sometimes forget your instruction. Faithfulness in training and counseling will help you. Our sin and Christian life as parents can also have a profound effect in their attitude and success in character growth. Guard your heart and keep it tender as you teach others for yourself. May the Lord bless you and help you in your parenting and guide you to the resources that will best fit your family. 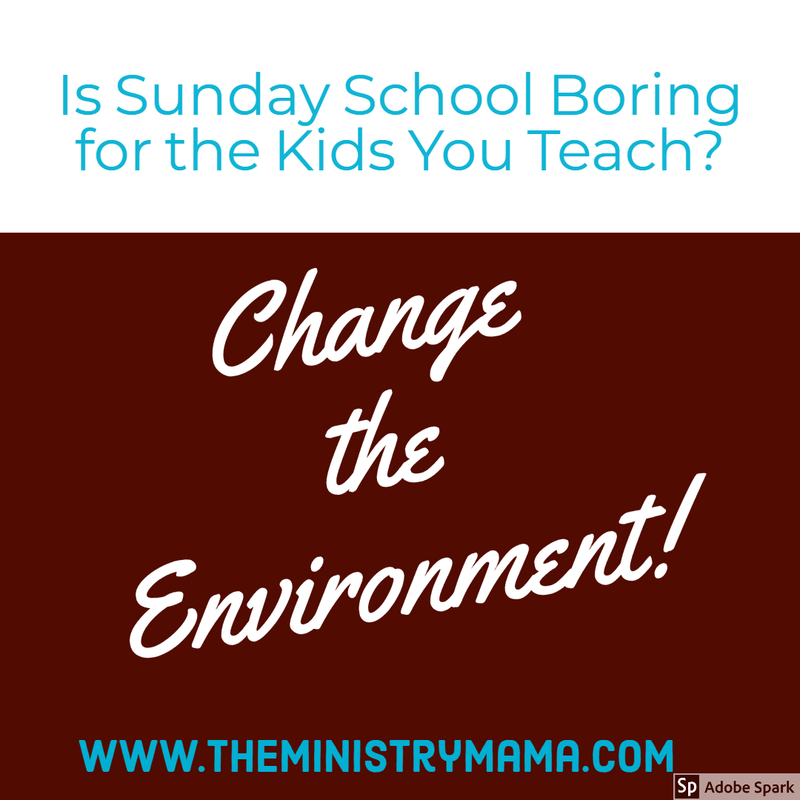 I want to highlight a specific part of ministry, one where you might have a larger influence, the Sunday School class. Not all women will have that influence because I know you serve where you’re needed or where you’re gifted, maybe you’re not a Sunday School teacher. I think that the idea and many of the basic principles can apply with this theme. Apply to any situation where you’re the teacher. If your church has grown stale and the people and flowers are not blooming it can be the environment of the church as much as it could be the environment they are cultivating in their own lives. Boring Sunday School classes create bored students. If things are not going well in your class, it may not always be the students, it may be the environment. Minutes before I saw the quote about flowers, as I was scrolling through Facebook, an advertisement asking parents and adults “Why do 75% of children quit going to church by the age of 18?” The premise of the advertisement said that the reason was because children learn the same Sunday School lessons year after year even into junior high and high school. Their curriculum was a topical lesson series that was meant to answer common questions children have about God and spiritual matters. The advertisement almost made me laugh because our children actually have had this happen between 3 churches we have attended in the past 3.5 years. When we were serving in ministry on staff they learned about Samuel and went through the book of Judges. When we joined the church plant the teacher curriculum was also in the book of Judges. Then, this year when we followed our pastor to a new church (it’s a special story I hope to tell down the road) guess where the Sunday School teachers were in their curriculum series!? You guessed it! Judges. And we’re talking about three different curriculums, classes, and teachers. Our kids had mentioned they were bored and I explained there must be some important lessons for their life right in that part of the Bible. Can you see how church could have been really boring if they were not engaged in their classes with good teachers giving different life applications over the past 3.5 years? Or they only went to church on Sundays? Or what if we did not talk about spiritual things at home? You can see how that there might be a possibility of becoming bored with church if this was the case. While I realize it’s not our jobs to “entertain” per se’ in the church, but we should be making our ministry work appropriately engaging. Sunday School is no exception, it is a significant opportunity for children to hear Bible teaching on their own age level. Cleanliness of the room should be maintained. Seats that allow the child to sit with their feet close to the floor. Tables that allow them to comfortably do their work or play. The walls should have neat decorations that are not a distraction. Decorations should change too and compliment the purpose of your lessons and class or at the very least, the seasons. You also want to have a window or the door to public walkways to allow accountability and prevent accusation, especially if you do not have a classroom helper. Do the best with what you have — maybe you’re using one-size metal chairs and they’re you’re desks for filling out Sunday School papers too, or you’re in a classroom that was not really designed to be a class, then you can only fix and work with what you have. The receptiveness of the spiritual message of the lesson is dependent upon the teacher’s effectiveness to communicate God’s intended purpose for the lesson. The heart of the teacher is the key to competent teaching. The character of your actions before and during class also will dictate “success” in teaching. Are you preparing enough in advance to study the lesson and allow God to work in your heart? Have you prayed for the Sunday lesson time and the children of your class? Do you have flexibility when things do not go as planned, to be able to come up with new ideas that will create interest or deal with problems? What is your personality in the classroom? How do your students perceive you? Which fruits of the Spirit are you exhibiting or should you incorporate? Are you engaging the children through eye contact and appreciation of their responses? Do you have sins exhibited in the classroom? For example, do they see impatience or anger when you deal with difficult people and situations? Through time often as teachers we can begin to rely on specific methods that we are familiar with and get into a routine of using the same types of methods of teaching. I’m going to encourage you to spice it up and try something new. Preparation of materials and supplies should be done ahead of class time. Utilize visual aids – Eyes and brains are connected, if you’re engaging their eyes they will more than likely be listening. A friend suggested engaging children by using the five senses, use a number of visual aids that will help them see AND experience the lesson. Use your voice – No monotone! Whisper, speak with excitement, use voices to portray characters. Read the Bible in an interesting way. Plan more activities than you will think you need. Always have time fillers whether they are little simple games, conversation starters, or simple coloring sheets, etc. Rotating through lessons systematically by grade levels (each age level is doing something different). Joyful Life’s curriculum has a great way of rotating the age groups through different parts of the Bible and not repeating year-to-year. When I was teaching regularly I would write out a classroom schedule including the songs we would sing, rules and expectations I had for the students, the lesson, review games, any other activities if we ended up going through the lesson faster than expected. Preparation and planning both the inside of you and the working parts of the classroom time can be a make-or-break element to a good learning environment. While in no way are any of these lists exhaustive, we are always in a need to liven up our skills and sharpen ourselves to effectively educate the younger generation about the truths of the Bible. I pray and hope that there will be an idea that you can use to be able to bring life to the environment of your Sunday School class. Sensory bins are popular right now for mothers all over the world and United States, but why not use these hands-on activities for a Sunday School class or teaching a Bible lesson? The sensory bin can be used as a great hands-on tool for teaching a Bible lesson or reinforcing a lesson as a hands-on activity for review through play for preschoolers through elementary school. They are made of a small bin filled with a filler (rice, beans, water beads, etc.) and other toys or other age-appropriate elements that would picture the elements of the story you are teaching. If you have never used one then I challenge you to read up on it here on my original post: Sensory Bins for Sunday School or read Sensory bins for teaching the Bible written by Annette at In All You Do. She tells you how to highlight a specific part of the Bible story you’re wanting to teach and make it into a sensory bin. 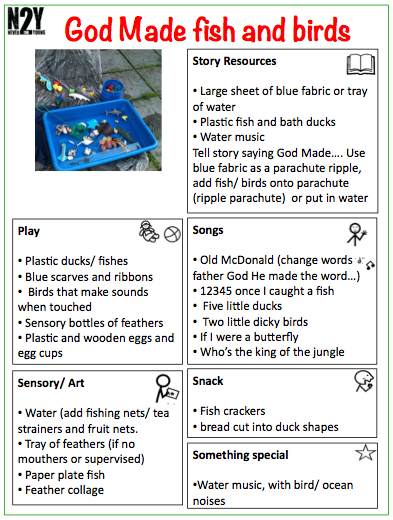 This Bible Sensory Bin Idea List comes from Bible sensory bins across the internet that will spark your mind for a little creativity in your classroom at church or at home. You could use the Sun Sensory Bin idea (seen above) at Finding Teachable Moments as an idea for day 4 of Creation. The Jewish Homeschool Blog has another great Creation Sensory bin. Moses and the Plagues sensory bin from Something 2 Offer. Check out this idea on Pinterest which is a Noah’s Ark Sensory Bin, where kids search for the animals in hay, identify them, and then put them into an ark playset. There’s another Noah’s Ark Sensory bin (halfway down the page) at Pink Sneakerz Homeschool. I liked the idea of using some type of blue cloth for water in this post. Bible Verse Sensory Bin – helps review Bible verses at aprilshomemaking.com. Monica at Childhood Spirituality creates great Bible Box activities you can read about here. The one listed here could simply be made into a sensory bin of the Ten Lepers. You could use little figurines like she has listed or simply make your own. The Parable of the Sower at Wugs and Dooey uses play-doh as the soil. Resurrection Sensory Bin from my sister site Ministry Mamas. Acacia in the Desert has a great list of awesome sensory bins including stories including, parting the Red Sea, the Tabernacle, the Sea of Galilee and other great teaching ideas. All Play on Sunday has a variety of ideas for sensory ideas or activities that would be good for children under the age of 6. My Mundane and Miraculous Life has a great sensory bin about how to talk about heaven to children in a way that they can understand. 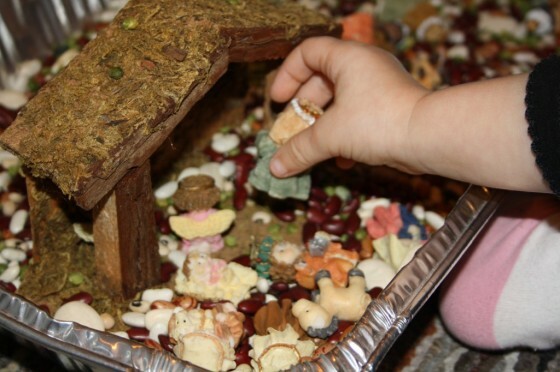 Nativity Sensory Bin with town and streets and a field for the shepherds at catholicicing.com. She gives a great break down of the items inside and how to make this bin. Growing Hands on Kids has a peg doll sensory bin that is great for toddlers. Another Peg Doll Sensory Bin (Nativity) at Frugal Fun for Boys. Nativity Sensory Bins with beans as the filler at Happy Hooligans. 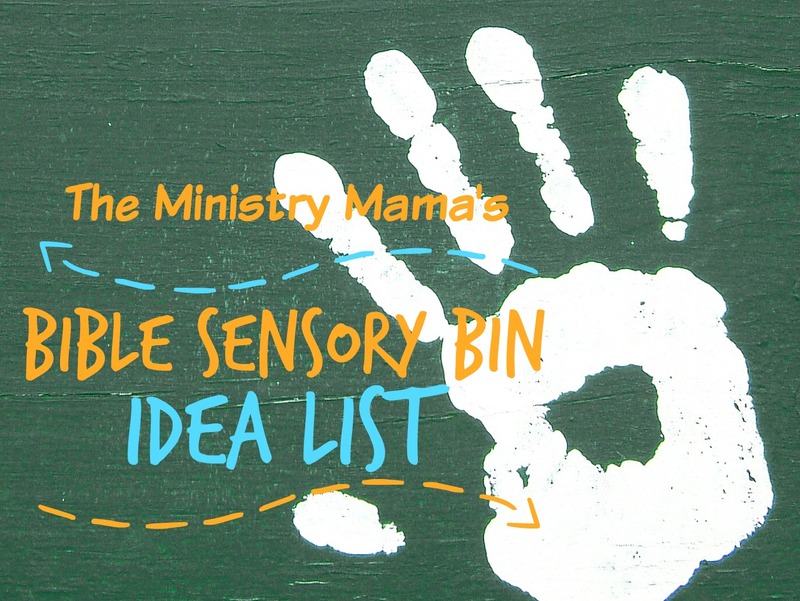 If you know of another great link or idea about making a Bible sensory bin please leave it in the comments!